Kudzu powder, called géfěn (葛粉) in Chinese, kuzuko (葛粉; くずこ) in Japanese, and chik-garu (칡가루) or galbun (갈분; 葛粉) in Korean, is a starch powder made from the root of the kudzu plant. It is used in traditional East Asian cuisine mainly for thickening sauces and making various types of desserts. ^ Shitomi, Kazuyoshi; Kumakura, Isao. 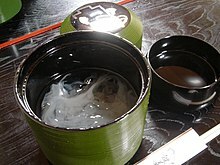 "The Japanese Table -- Dried Tofu, Noodles and Starch -- Kudzu Starch: Kuzuko". Kikkoman. Archived from the original on 2010-10-09. This page was last edited on 4 October 2018, at 21:33 (UTC).